To provide a very basic introduction to the geography of Japan, and also to experiment with the art technique of drawing with a wax that will resist the application of a water-based paint. 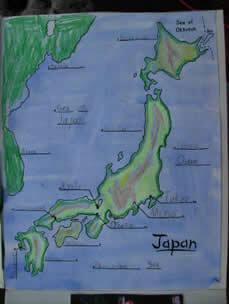 Students label and color map of Japan. Crayons are used to color the islands so that when a blue watercolor wash is applied, the wax resists the water-based paint and the islands don’t turn blue.